After experimenting with Teflon, anodized aluminum, and stainless steel, many cooks are tossing the expensive, high-tech stuff in favor of an old standby: cast iron. is relatively inexpensive, healthy, and almost indestructible. Even better, well-seasoned cast iron has a slick, almost Teflon-like coating – but without the health concerns now swirling around Teflon. If you're wondering how to season cast iron, cook in it, or how to care for the skillets you inherited, read on. Cooking with and caring for cast iron is easier than you think. Although it looks and feels pretty solid, cast iron has a porous surface. When you "season" it, you're filling in the tiny holes and creating a smooth surface for cooking. Each time to you cook in it, you're adding a little more seasoning. Although some cast iron cookware is sold as "pre-seasoned," it has the bare minimum of seasoning needed to make it usable. For best results, season all cast iron yourself – even if it's pre-seasoned. The more you use cast iron, the better seasoned it becomes. 1. Wash it gently with dish soap. This is the only time you'll ever use soap on your cast iron, but you want it to be clean to start with. 2. Lightly coat the pan with vegetable shortening. Bake in a pre-heated oven (250 to 300 degrees). Bake pan for 20-30 minutes. Remove, wipe away excess shortening, return it to the oven, and bake for 2 hours. At this point, the pan is seasoned enough to use, but consider repeating the second step two or three times to get a good cooking surface. Note that step #2 doesn't require an oven. We had good results recently seasoning a new skillet by greasing it up and sitting it on top of the woodstove on cold days. When the skillet is new – meaning the first 7-10 times you use it – try to cook foods with a fair amount of oil or high-fat foods. Avoid highly acidic foods like tomatoes because the acid will strip away the seasoning at first. Once the pan is well-seasoned, you can cook anything you like in it! The more you use cast iron, the better seasoned it becomes. Here's a photo of the small, 6-inch skillet my husband inherited. It's been used for at least 50 years, and has a smooth, almost glass-like finish. We treasure it and make sure we care for it properly. Properly cared for, cast iron cookware lasts for decades – or generations. The key is caring for it properly. Never, ever use dish soap on seasoned cast iron! One good scrub with dishwashing liquid can strip away decades of seasoning. Cast iron pieces have the happy distinction of being dishes you aren't allowed to scrub. Well-seasoned cast iron can be rinsed with hot water and wiped out with a paper towel. If any food residue is stuck to the pan, gently brush it with a nylon brush. It's important to thoroughly dry cast iron. Moisture left in the pans can cause it to rust – which means you have to start the seasoning process all over again! Help your cast iron maintain its beautiful finish by applying a very light coat of shortening after it's dry. This is really important if you have a new pan or one that needs additional seasoning. After drying the pan, heat it on the stovetop for 20-30 seconds – just to warm it up and make sure it's completely dry. Then, use a paper towel to lightly coat it with shortening. This protects the surface from moisture and helps build the seasoning coating even more the next time you cook. 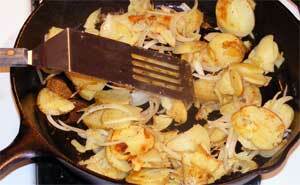 Cast iron skillets are versatile; they can be used on the stove top or in the oven. They withstand high temperatures and hold heat well – which makes them great for frying and browning. What can you cook in cast iron? Anything. But some dishes seem to require cast iron to cook and taste properly. Many Southern cooks won't use anything but a cast iron skillet for traditional fried chicken. And, of course, a cast iron skillet or corn stick pan is essential for good Southern cornbread. Without it, you'll never get the crispy crust that makes it such a crunchy, sinful treat. Here's a family recipe that I learned to make without measuring anything. We just added milk, etc. until it "looked right." So for this post, I actually had to measure everything – which was surprisingly stressful! Place 1 tablespoon shortening in a 6-inch cast iron skillet. Put skillet in the oven and preheat oven to 450 degrees. Place cornmeal mix and powdered egg white in a small bowl and stir together. Melt remaining tablespoon of shortening and set aside. When oven is preheated, quickly add the shortening and milk to the cornmeal mixture. Stir. Add water as necessary to make a batter that's easy to pour, but not runny. Remove skillet from the oven (the oil may be smoking a bit, that's ok) and pour cornbread batter into the hot pan. Always make sure the oil is hot before you pour in the batter. If you aren't sure, drip in just a few drops of batter. If it doesn't sizzle, the pan isn't hot enough and you won't get a good crust. 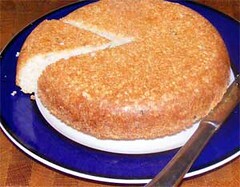 Reduce heat to 425 and bake approximately 15-20 minutes or until cornbread is light brown on top. Remove skillet from oven and lightly run a knife around the outside of the cornbread. Turn the pan upside down onto a plate. Cut the cornbread into sections and serve immediately. It dries out quickly. 1. If you use a fresh egg white, reduce the amount of liquid by 1-2 tablespoons. 2. Add 1-2 tablespoons chopped jalapeno peppers to batter for a Mexican touch. 3. Add 1/3 cup grated cheddar cheese to make a cheesy cornbread that goes great with chili. All of the new cast-iron skillets are rough surfaced, not smooth, as in the “olden days”. I DO NOT like this surface, and would like to find one with a smooth surface … any ideas where I can find them? great tips on cleaning the iron skillet, i got an old one i never use, now i can start (once i clean it), and any idea how to cook a chicken stew in a cast iron skillet?